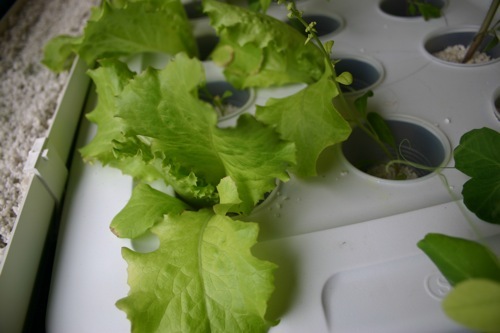 My aquaponic garden got off to a really good start, but unfortunately, things slowed down once summer started. There were a couple of things that contributed to the problem—one, the tree in our yard got leafed out; and two, during the summer, the sun was too far up in the sky to really shine into the window. Since the plants weren’t getting enough light, they never made it to flower. They did, however, keep growing. One of the tomato plants reached about seven and a half feet long. 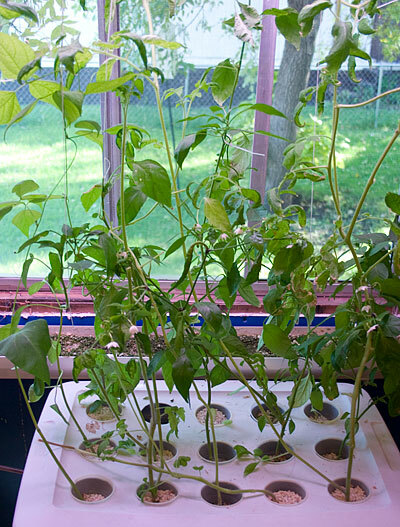 Another problem was that I did not have anything to prop the tomatoes up with, so once they got about the height of the window, they flopped over and started crowding everything else out—this killed off the herbs that they covered up. We did eat some of the lettuce despite the fact that it never formed a head, and I got one pea flower, but nothing came of that. Now, as the sun has been lowering in the sky, the plants have started forming new growth, and their growth has accelerated in general, so I also got a four foot shop light which I have mounted on a wire shelf above the window. The light has grow lamps in it, and I have tied the plants up with string and cable ties hanging from the shelf. 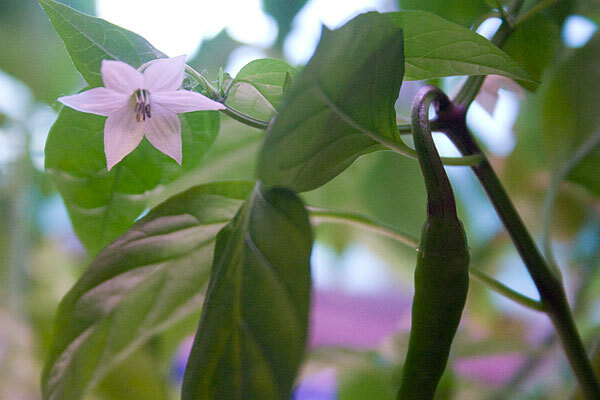 This has helped a lot, and I now have about ten cayenne peppers growing, in addition to fourteen more open pepper flowers, and two tomato flowers. There are more buds besides these, so I am hoping they will keep producing for a while. I’ve been trimming back the tomatoes, because when they were just laying down, their leaves got damp, and they started forming some brown spots (one plant in particular). I also planted some green beans it a few weeks ago which are getting ready to flower now, as well as some cucumbers and lettuce, which are still baby plants. Although the summer growth was a little disappointing, I am optimistic that the plants will do better not that they have some light. Well, it has been seven weeks since I planted my seeds—about five and a half since I started transplanting seedlings into the aquaponics setup. Everything is still going well, except that the spinach is not really leafing and one of them has started to bolt. I think having the light on late in the office is causing them to think the days are longer than they are. My grow bed wasn’t big enough for my tastes. I know an aquarium of that size can support more plants, so I got an eave trough, and trimmed it down to the length of the window. Now the water from the tank pumps into the trough (which is full of perlite), and drains from it back into the aquarium. 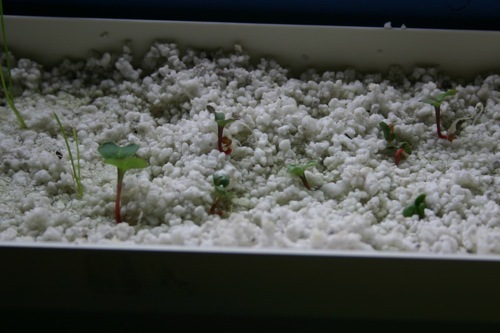 I transplanted some onion seedlings which I had germinated in some moist perlite into it as well as planting some radish, chives, cucumbers, peppers, and leaf lettuce in it. The radish and lettuce seeds sprouted in a matter of days. I also transplanted some oregano and thyme sprouts into it. The plants were turning a little yellow, so I added an air pump to get some more oxygen into the water. 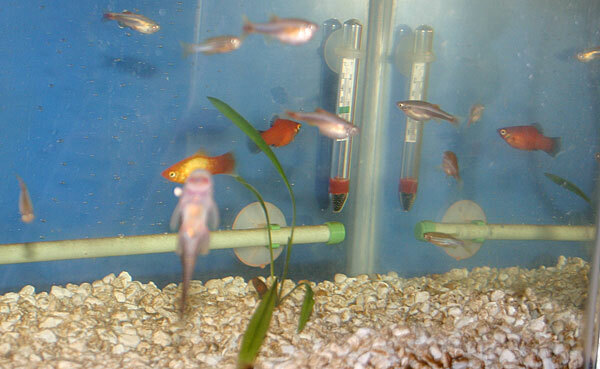 The nitrites in the tank are high, but the fish seem to be coping well. I am hoping the four feet of perlite in the trough will provide additional growing surface for the bacteria that break down the nitrites. I also added five more pounds of gravel to the aquarium to provide more surface area for the bacteria. These pictures were taken one week after the pictures from the preceding post. 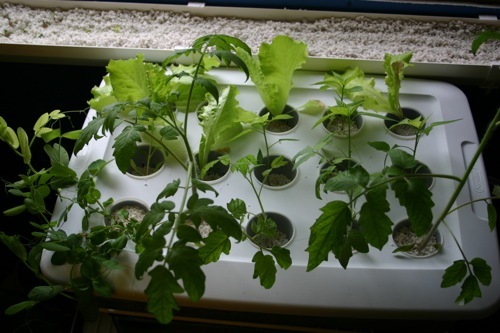 For those who are interested, my aquaponics experiment seems to be going quite well. We went to my parents’ house for a week, and so the aquarium was unattended during that time. I used a vacation time-release food tablet to feed the fish. One of the fish died shortly after we got back—probably due to the fact that the tank is not really established yet, and I wasn’t there to do water changes while we were gone. The plants have shown significant growth. 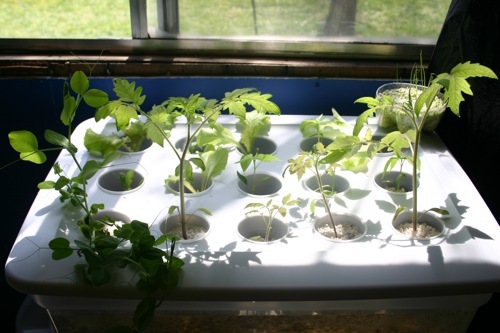 You may notice that the setup has been moved next to a window to give the plants more light. Today, I got an eave trough that I have mounted to the wall under the window. I am going to run water into the trough, and have it drain from the trough into the existing tub. This will allow me to grow more plants! Here are the roots from one of the tomatoes. Well, spring is almost here, and as usual, I am planning on having a garden. Last year’s didn’t work out so well. I was so busy working that I didn’t have time to weed, so most of it got overrun. I didn’t get any onions, I only got a few small carrots (the slugs got into them). I didn’t get any broccoli or cauliflower. The cayenne peppers, oregano, sage, rosemary, and thyme didn’t even sprout (that I noticed). I did get some spinach, peas, beans, and squash. The lettuce bolted to seed, and I only got a few tiny radishes. The tomatoes did pretty well, but they froze before they ripened. I have come to the conclusion that besides not having time to keep it up last year, many of the veggies did poorly because I did not get them started soon enough—especially the tomatoes and lettuce. They probably would have done better had I started them in protected planters too instead of sowing directly into the ground. 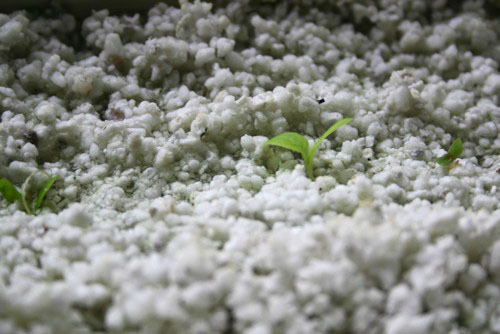 Anyway, this year I hope to do a little better, so a week ago I planted several seeds in a tray of pete pellets. 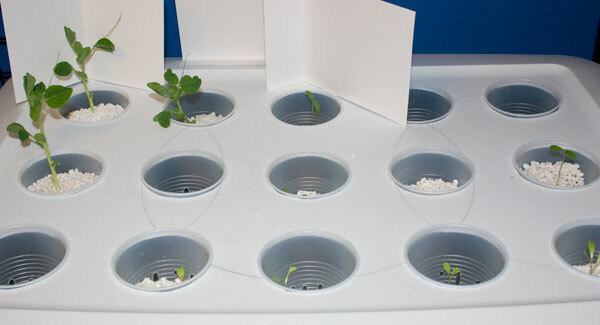 Almost all of them have already sprouted, and some of them are already a few inches tall. I’m also trying my hand at aquaponics this year. Basically it’s growing plants hydroponically using water from a fish tank instead of water that has had plant nutrients artificially added. Bacteria in the tank breaks down the fish waste into chemicals which the plants use as nutrients—functioning as a filter and cleaning them from the water. I have a pump set to pump water from an aquarium to a storage bin which has plants suspended from the lid in such a way that the roots hang into the water. The water then drains back into the aquarium. 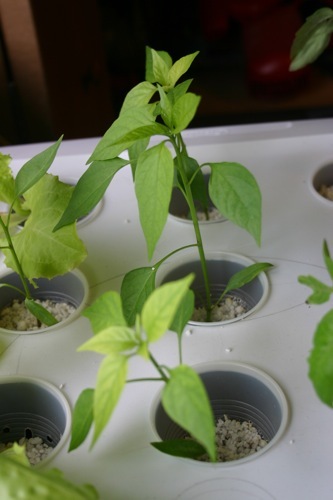 I have been transplanting some plants from the pete pellets as their roots become long enough to reach the water. Some have been in the tray for several days, and they are doing fine. So far, I have three pea plants, two tomatoe plants, four lettuce plants, and two spinnach plants. 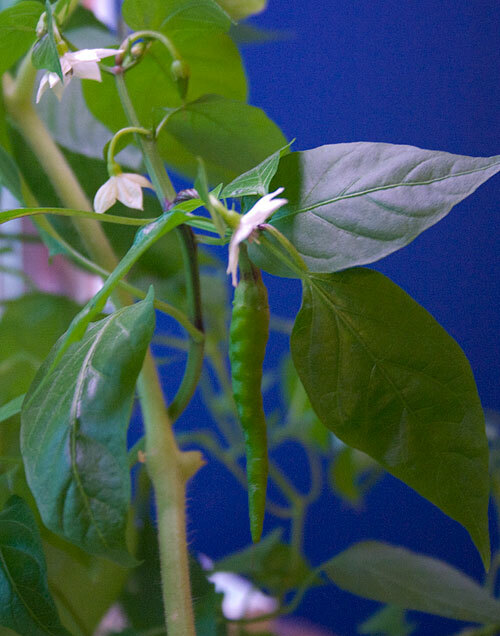 I plan on adding two cayanne pepper plants and a couple of herbs when their roots get big enough to reach the water. 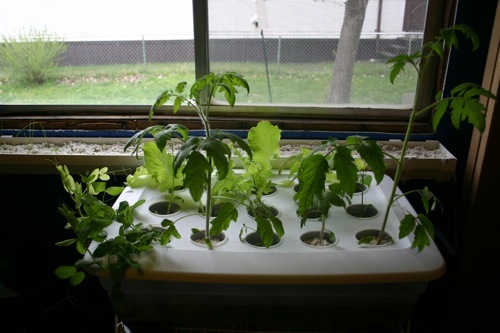 Tray of hydroponically growing plants. 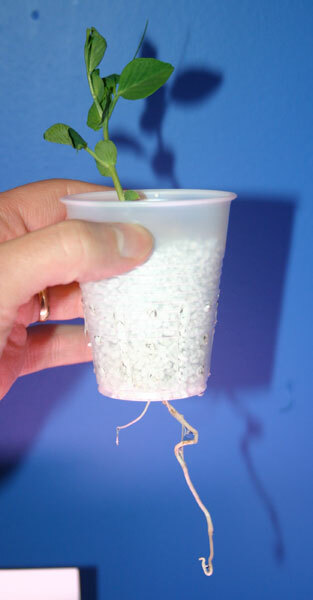 Each cup contains perlite and has holes in in through which the plants’ roots hang into nutrient-rich water. 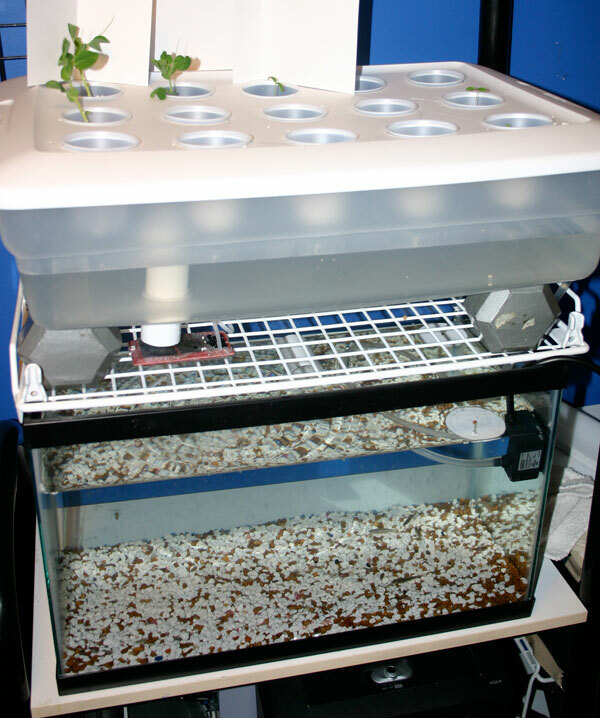 Full aquaponic setup with an aquarium containing eleven fish, a bin where plant’s have roots suuspended in water, and a pump to send water from the aquarium to the plants. Pea plant in a cup. 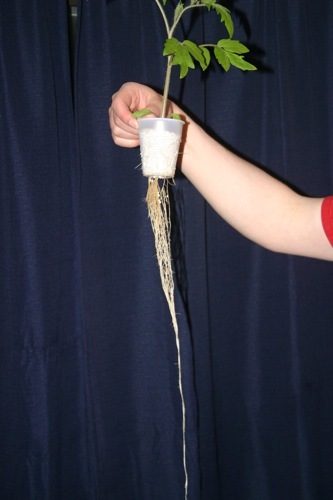 The roots suspend into nutrient-rich aquarium water. 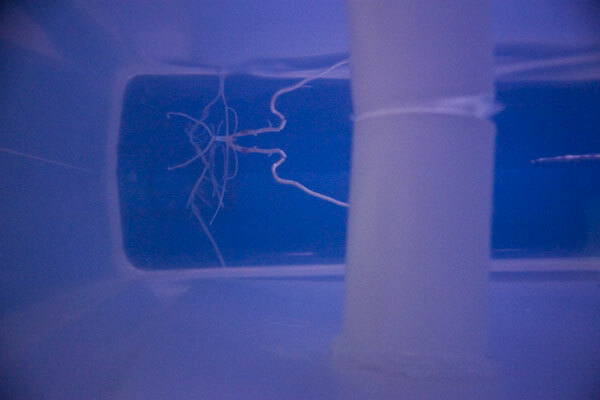 Roots inside the bin of nutrient-rich aquarium water. Also, a pipe that drains water back into the aquarium. Reporting Live from the Birchler Bunker. The cat is still alive (although he’s had some very narrow misses involving his dirty kitty feet, my freshly-cleaned kitchen counters, my short temper, and a meat cleaver, but we’ll leave those stories buried for now). Aaron won’t let me heap deserved retribution upon his little kitty neck, so for now, I just have varicose veins in my throat from yelling at him, and a perpetually empty squirt bottle that is intended to be used as retribution, but is instead used by a certain toddler to dampen the carpets, his socks, his sister, his mouth, and various other usually-not-intended-to-be-moistened items, so that it is never around when needed. Hankie, however, has not fallen under Aaron’s “Don’t Kill the Cat" edict, so he cheerfully works at severing kitty toes whenever the kitty leaps atop his cage in a blaze of bravery. Or stupidity. Whichever. Abby, in her usual conquer-the-world fashion, has stood up on her own two feet and toddled off. We are not surprised that she has done this before she even turned a year old, but I, personally, was hoping for a chance to fully recover from her older brother’s launch into mobility before she followed in his footsteps (quite literally). But whatever. And for those of you who think that a year and a half is plenty of time to recover from your progeny grasping the finer points of bipedalism, I say, “Go have your own baby." And, somewhere along the way, while I was still stuck on the fact that my son learned to walk, the kid got taller. Tall enough to reach Forbidden Items that were once safely stashed atop the counter. Forbidden Items being knives and hot pans and mommy’s package of Double Stuf Oreos that she absolutely, without exception, does not share. Ever. World without end, Amen. And, if that were not disaster enough, Christian has also discovered that chairs make wonderful height-extenders, for those times when Mommy thinks she will out-smart her two-year-old and stash her double-cream-filled chocolate sandwiches up, up, up, on top of the microwave. Or the refrigerator. Ah, to have those good ol’ days back, when Mommy could eat her yummy, chocolaty-goodness-cookies while shoveling spoonfuls of pureed peas in her infant son’s mouth hole, and he wouldn’t know the difference. Sigh. In other news, Christian, my chair-climbing giant, is learning how to go potty in the potty now. Since potty training was Daddy’s idea, Mommy has decided that the only way for the credit to be properly attributed to him is if he sits on the (uncomfortably narrow) edge of the bathtub for forty minutes while his Toddler son sits on the potty seat and pulls imaginary planes, trains, and automobiles (not to mention LionsTigersandBearsOhMy) out of the toilet but cannot, oh no not ever, make water come out of his ding-a-ling. Until five minutes after he has gotten off the potty and is sitting on Mommy’s upholstery, dangerously undiapered. But we have made progress, now, I think, thanks to the BIG TRACTOR STICKERS that we bribed him with. He was so very excited to get a BIG TRACTOR STICKER for going all day pottying in the potty and not on Mommy’s upholstery, that he ran, not walked, to the bathroom and promptly made water come out of his ding-a-ling. Yea, verily, gave us proper advanced notification before doing so. Thank you, BIG TRACTOR STICKERS. (And thank you, God, that stickers did the trick, so I would not have to resort to using my precious Double Stuf Oreos as an incentive.) We have now gone two days without having to clean up Toddler pee. If only we could say the same for the dog. But that’s another story, for another cleaver day. Kari Birchler, signing off. Quickly. Because Christian is giving me Proper Advanced Notification again.